As an abstract painter, Chris Trueman (seen here in his studio) continues a tradition whose Western fine art beginnings reach back to the start of the 20th century. 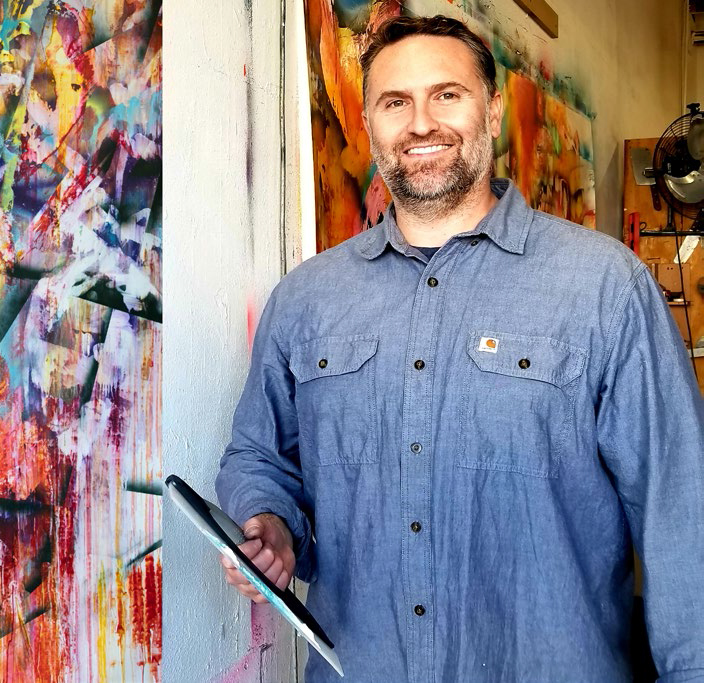 If it's a sunny day in Upland, California—and it usually is—you can learn about Chris Trueman's art just by walking by the studio where he works. All you need to do is listen. The artist often keeps his large roll-up studio door open so he can take in the San Gabriel Mountains that loom to the north, making it easy to hear his workaday artist's soundtrack—mixtapes of dance, electronic, and downtempo sounds. Trueman is an abstract painter, continuing a tradition whose Western fine art beginnings reach back to the start of the 20th century. It's a tradition that has been declared dead numerous times, most succinctly by the conservative artist and writer Wyndham Lewis: "The abstract is dead of a very customary complaint of civilized man: boredom," Lewis wrote in 1940. And let's not forget, by the way, how many times over the past several decades the entire enterprise of painting has been declared dead. Early on, Trueman contemplated focusing on digit rather than paint. Alas, he had no choice, as he learned while studying at the San Francisco Art Institute. His digital creations kept looking like paintings. 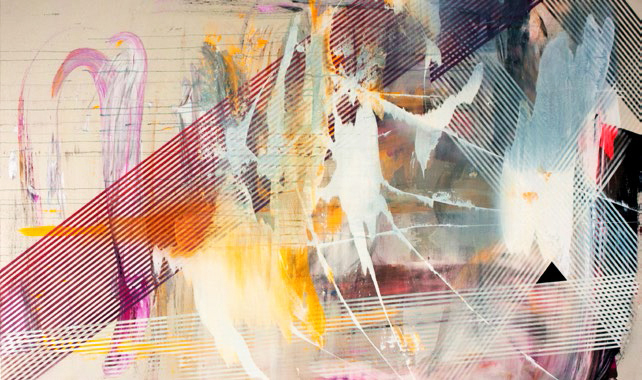 "My professor told me, 'You're switching media, but you are essentially painting.' When I graduated, that stuck in my mind. So I thought, rather than creating new media with old ideas, I would use old media with new ideas." 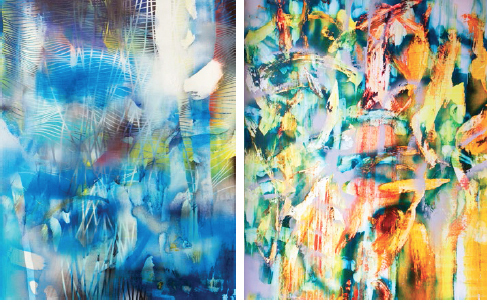 "We are hopefully making work about what is happening now," Trueman says of his paintings. Abstract his paintings may be, but they explore many of today's hottest topics, depending on who is looking and how closely they look. Moods range from dystopian to exuberant. They delve into people's retreats from the real world into virtual space, explore where virtual reality begins and real reality ends, and can suggest speed and violence and malevolent weather. You can see in Trueman's paintings our changing landscapes, seascapes, and urban-scapes—and much else. "When I look at Chris's work, there's a kind of joyfulness, there's a kind of extemporaneous-ness, there's a kind of motion that happens in his work that makes me feel a kind of freedom, a kind of boundlessness with how I experience the world around me," says Edward Cella, who shows Trueman's art at his eponymous gallery in Los Angeles. Jim Lampley, the sportscaster known for his work on HBO's boxing broadcasts, sees other messages in Trueman's art. Lampley has five Trueman canvases in his home in Del Mar, near San Diego.